UP to 1,000 people of all ages are expected to take part in the annual fun run in Oldbury-on-Severn - one of the biggest events of its kind in the South West. Registration has opened for the event, which involves serious runners coming under starter’s orders first for a competitive road race, followed by the rest of the field setting off on the four-mile course. Runners, joggers and walkers, including some in fancy dress, will line up outside the Anchor pub in the heart of the village to be sent on their way. Each will be given a timing chip to record their performance and prizes will be awarded in a number of sections for adults and children, as well as the best team. The route to be followed takes in local roads that will be closed to vehicles while people are making their way round. Meanwhile, a small part of the village on Church Road will be closed all day for a number of activities taking place throughout the afternoon, ranging from displays, competitions and games to live music and a Punch and Judy show. Food stalls will also be set up. Organisers said they were encouraging as many people as possible who want to take part to register in advance to make it easier on the day, as well as cheaper for the entrants. Pre-registering costs £8 - or £5 for under-13s - but will be £3 more expensive for same-day entry. 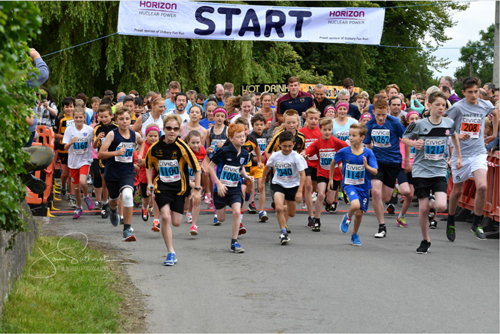 Traditionally, the fun run has raised money for the children’s cancer charity CLIC Sargent and to date has collected many thousands of pounds for its work, as well as helping village-related charities and events with smaller donations. The event takes place on Sunday, June 25, with the Red Start road race, organised in association with Thornbury Running Club, getting underway at 11am. The Blue Start fun run action is scheduled to begin ten minutes later. Details are available online at www.oldburyfunrun.co.uk and include information on registering. Photo courtesy of Jo Sutherst.